This book - a comprehensive Dorati discography, supplemented by several essays written by musicians, critics and others who worked with the conductor - is the second book to appear from this source. The companion volume, Antal Dorati and the joy of making music (2006), a register of all concerts given by the conductor, was reviewed by me in 2007 for MusicWeb International (link). This is not the first Dorati discography to appear in print. A previous compilation, entitled Hungarians in Exile by John Hunt, included discographies of three conductors: Antal Dorati, Fritz Reiner and George Szell. Richard Chlupaty made a significant contribution to that book and the new volume again reveals his research to have been very thorough. The discography which forms the core of the book is actually presented twice, both alphabetically (by composer) and chronologically. Each entry includes not only the original recording date but also all subsequent dates of reissues and record catalogue numbers. In addition to the commercial studio recordings made by Dorati for Mercury, Decca, Philips and other labels, the listing includes a significant number of radio recordings held in radio and private archives. 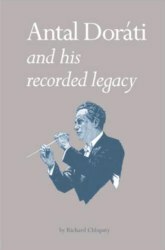 In my review of the companion book I commented on the surprising number of Mahler symphonies programmed by Dorati in his concerts. Amazingly this discography lists no fewer than seven versions (with seven different orchestras) of Mahler’s Sixth, of which six versions are available on CD. The existence of so many radio archive recordings means that we can contemplate the future possibility of an almost complete (missing Nos. 3 and 7) Dorati Mahler cycle. I have to admit that, while admiring the accuracy of Chlupaty’s painstaking research, I did wonder whether the internet might offer a better format for such data, not least in terms of the facility of updating. In his list of acknowledgements Chlupaty regretted that three orchestras conducted by Dorati did not allow him access to the contents of their archives, which offers the distinct possibility of more recordings being added to the discography in the future. The discography aside, some may regard the contents as offering a somewhat rose-tinted view of a controversial conductor. You might feel that a line is crossed when reading Bill Newman’s effusions in his suggested list of recordings: “... one of the outstanding performances of the last century” (Brahms Symphony 1) or “... the performance to end all performances” (Mahler Symphony 2). There are however recollections of incidents involving Dorati’s notorious temper tantrums, which evidently were not limited to the recording studio; his daughter Tonina recalls “moments of blackness” which were brief. “Though not brief enough”. This is a handsomely produced book, with about 400 illustrations, mainly photographs of Dorati and musicians who worked with him, including also some colourful reproductions of LP covers. It is unlikely to be of interest to a wide audience but loyal fans of the Mercury Living Presence label and this colourful conductor will find much to enjoy here.